Convenient stick packets allow guests to easily apply mayonnaise. 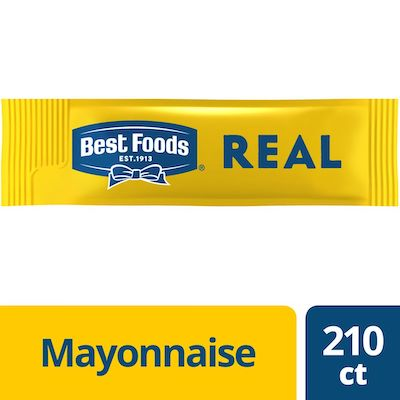 Best Foods Real Mayonnaise is made with real eggs, oil, and vinegar for a rich, creamy flavor that your guests can savor. Ideal for cafes, restaurants, hotels, and more. Soybean oil, water, liquid whole egg and yolk, vinegar, salt, sugar, concentrated lemon juice, calcium disodium edta to protect quality, natural flavour. Contains: egg. Best Foods Real Mayonnaise is made with real eggs, oil, and vinegar for a rich, creamy flavor that your guests can savor. Ideal for cafes, restaurants, and catering services, the convenient packets allow guests to easily dispense mayonnaise and minimize mess and waste. This mayonnaise not only pairs perfectly with signature burgers and sandwiches, but it also can be used as a creamy dipping condiment. With its smooth mouth feel and balanced flavor, it is sure to impress even the most discerning palates. Maintains cling, consistency and stability-even when heated. Outstanding performance reduces waste and lowers cost. Guests want to top their sandwiches and burgers with the best mayo, and they expect Best Foods® within reach. Best Foods Stick Pack Mayonnaise delivers the real mayonnaise guests want in a package that's user-friendly with less waste and less mess. Great for sandwich fillings, deli dip, and making compound salads (potato, macaroni, etc. ).